Great article about millennials and witchcraft - Ideas, Culture Track blog. In the past few years, millennials have fallen hard for all things witchy-- and some longtime practitioners are less than thrilled. 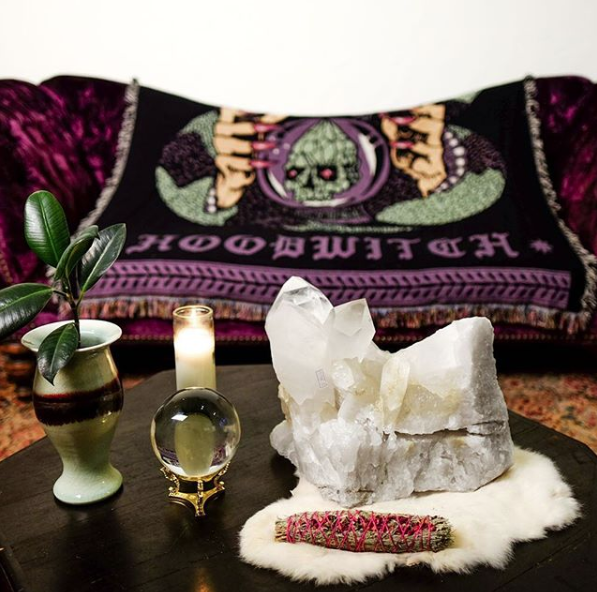 Inside the witchcraft-as-wellness movement. A still life from The Hood Witch’s Instagram page. Courtesy of @thehoodwitch via Instagram. If you have noticed tarot cards, crystals, and sage invading your social media feeds, you are not alone. In the past three years, millennials have fallen hard for all things witchy. In her 2015 book Witches of America, Alex Mar estimates that there are up to 1 million people practicing some form of Paganism in the US (which for comparison is only slightly less than the number of Buddhists at 1.2 million). Witchcraft is popular among non-Pagans as well. Data from the online marketplace Etsy shows that searches for witch-related paraphernalia went up nearly 30% from 2015 to 2017, with purchases increasing by almost 60%. Businesses related to witchcraft abound: you can get your spiritual accessories from companies like the subscription service Mystic Lipstick, or Awakening in a Box; from marketplace sites like Etsy and Depop; and even from mass retailers like Urban Outfitters, Hot Topic, Dollar General and Walmart. Why all the recent interest in the occult? Melissa Jayne, the owner of Bushwick’s witch shop Catland, tells Quartzy that witchcraft “offer[s] tangible ways for people to enact change in their lives,” adding, “For a generation that grew up in a world of big industry, environmental destruction, large and oppressive governments, and toxic social structures … this can be incredibly attractive.” Millennials seem to gravitate towards witchcraft not necessarily for religious reasons, but rather because they are interested in alternative spiritual practices that can be used as a form of wellness. Americans have always had a healthy interest in witchcraft–an interest that tends to pique during times of war, technological upheaval, and social unrest. In the 18th and early 19th centuries, spiritual communion–communing with the dead–became a popular part of Protestant sects throughout the country. By 1867, Spiritualism had ascended to a major religion, with some reports claiming that one-third of Americans participated in Spiritual practices. Charles Kennard, capitalizing on the popularity of spiritualism, patented the Ouija Board in 1891. 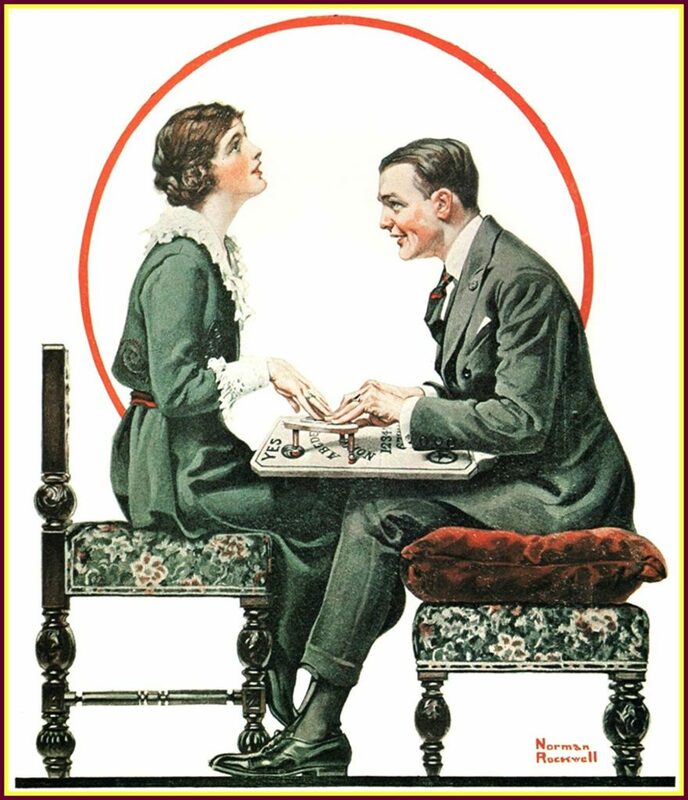 The board became wildly popular in the 1910s and 1920s, following the devastation of World War 1 and the energy of the Jazz Age and Prohibition, and again during World War 2. In the 1960s, programs like Bewitched entered Americans’ living rooms. The feminist group W.I.T.C.H. waged movements protesting the Stock Market and Vietnam War. In the 90s, Hollywood films like The Craft and popular TV shows like Sabrina, The Teenage Witch, Charmed, and Buffy The Vampire Slayer taking over popular culture. Appropriately, contemporary television has re-ignited its interest in the occult, with new programs geared towards millennials including a re-make of Charmed, The Chilling Adventures of Sabrina, and a rumored reboot of Buffy The Vampire Slayer. Norman Rockwell's "The Ouija Board." Courtesy of Amazon. Today’s obsession with witch culture has thrived in cyberspace, where it has become aligned with a post-Third Wave feminism. Aysha Khan writes that rather than casting spells and communing with spirits, modern witches are more concerned with “resistance, subversion, and feminism.” As Corin Faife points out, Instagram is a nexus for witch enthusiasts and merchants alike, “with tags like #witch (more than 3.7 million posts), #witchy (more than 600,000) and #witchesofinstagram (nearly 700,000) bring[ing] a community together around a constellation of imagery.” Witchy millennial influencers like The Hood Witch and Ethereal.1 have accrued mass followings, with 365,000 and 168,000 followers, respectively. Mikaella Clements notes that witchcraft has also thrived on Tumblr. But because of the fleeting and often flippant nature of social media, Clements notes, “it can be difficult to tell sometimes how seriously Tumblr witchery is to be taken.” While some newfound occult enthusiasts are interested in the history and rituals of witchcraft, others, like Jaya Saxena, co-author of Basic Witches: How To Summon Success, Banish Drama, and Raise Hell With Your Coven are more interested in “the cultural image of a witch as a separate and valid identity,” unrelated to religious practices. Taking and running with a ‘cultural image’ without acknowledging the religious or historical background of that image can often end up looking a whole lot like appropriation, especially if former practitioners were not afforded the same distinction. There is a long history of white colonizers persecuting indigenous populations for practicing non-Western dogmas. 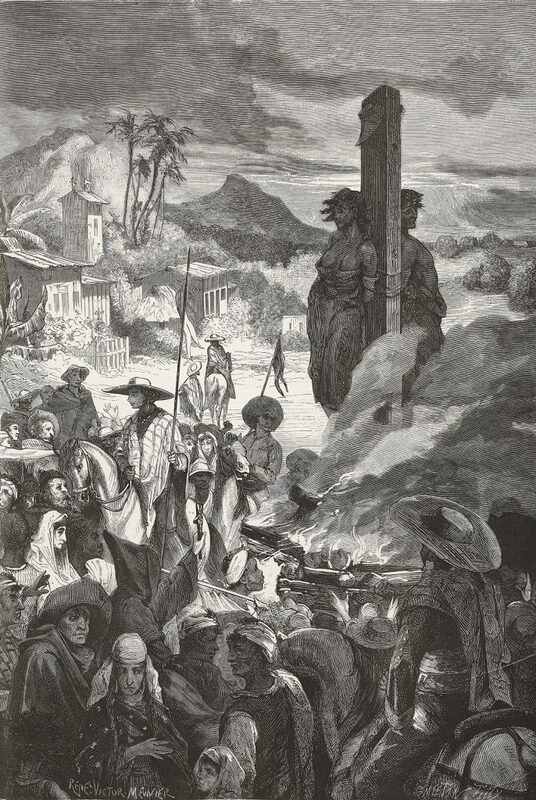 In the 15th and 16th century, Spanish colonizers persecuted populations in the Caribbean, South America, and Central America for practicing Brujeria, forcibly converting thousands to Catholicism and leading to the persecution of healers throughout the colonies. In colonial America, African and Central American slaves were punished for practicing Hoodoo (also called conjure or rootwork), a form of spiritualism derived from traditional African folk beliefs, healing customs, and practices passed down through generations. Laws were enacted to prevent the spread of Afro-religious practices, and caricatures of “witch doctors” abounded. In Haiti, Vodou (sometimes referred to as voodoo) emerged as a response to slavery. Kim Wall and Caterina Clerici write for The Guardian that in the 1920s and 1930s in the US, B-movies like White Zombie helped reinforced caricatures of Africans as “hypersexualized, superstitious, and demonic.” In the United States’s 1692 Salem witch trials, around 150 people were accused of practicing witchcraft, and 18 were put to death, with a slave named Tituba shouldering the majority of the blame for the outbreak of witchcraft in the colony. Even today, people are persecuted for practicing witchcraft. In 2011, a Saudi woman was executed by the government because of claims she was a witch. Reports of individuals practicing witchcraft– and ensuing punishment, often enacted by government officials– still regularly occur in many countries including Tanzania, Nepal, and the West Indies. Two witches being burnt at the stake in Mexico, illustration by Smeeton and Tilly and Meunier from L’Illustration, July 11, 1874. Courtesy of Getty Images. Given this history of violence and persecution, casual millennial consumers of witch products who are not aware of witchcraft’s story can come across as flippant or appropriative. When Sephora announced plans to sell a “Starter Witch Kit” from the perfume brand Pinrose, customers protested. Gabriela Herstik, author of Inner Witch: A Modern Guide to the Ancient Craft, tells HelloGiggles that the kit, which was set to retail at $42 and included a deck of tarot cards, a bundle of white sage, a rose quartz crystal, and several small Pinrose samples, “just felt like capitalism at its worst, selling something because its trendy instead of working with actual stores owned by witches,” adding, “Sephora has enough money to hire a witch to be a consultant, partner with independent sellers, and actually make something real, powerful, and magical! And they didn’t.” Pinrose pulled the kit following backlash. Similarly, Urban Outfitters removed its $39.99 Local Branch Smudge Kit, which featured a “wild turkey smudging feather, stoneware smudging dish, candle and instructions,” after the company faced criticism. 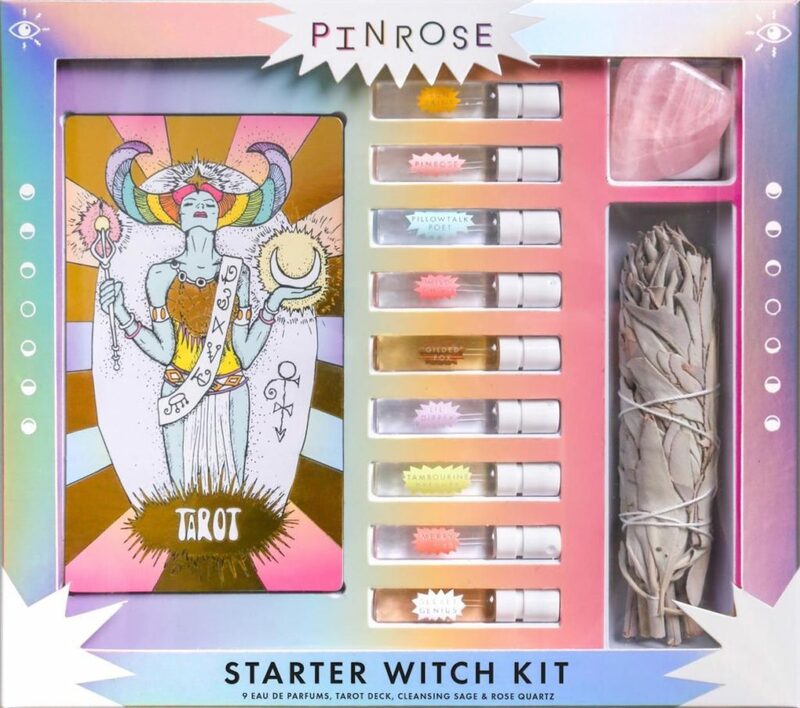 Pinrose's Starter Witch Kit. Courtesy of HelloGiggles. In her article “How Goop’s Haters Made Gwyneth Paltrow’s Company Worth $250 Million,” Taffy Brodesser-Akner writes of the 21st century’s love of new-age wellness, “the wellness point of view [has] invaded everything in our lives: Summer-solstice sales are wellness. Yoga in the park is wellness. Yoga at work is wellness. Yoga in Times Square is peak wellness. When people give you namaste hands and bow as a way of saying thank you. The organic produce section of Whole Foods. Whole Foods. Hemp. Oprah. CBD. ‘Body work.’ Reiki.” Brodesser-Akner writes that, in the face of existential crises, more consumers have turned to new age or spiritual cures for their malaise, creating a culture surrounding a vague sense of “wellness” that really has no consistent identity other than its affiliation with the upper-middle-class. We can see something similar happening with the witchcraft-as-wellness movement: magic becomes a metaphor for young people, a means of attaining that elusive element of control and happiness. Nobody would argue that there is anything wrong with millennials seeking spiritual guidance, yet the people who really stand to benefit from the witch trend are not practitioners of Hoodoo, rootwork, Vodou, or Paganism, but rather large companies. In an article for Racked, Aminatou Sow writes of feminist merch, “Shopping is shopping and political action is political action, and no matter what anyone says, it’s very hard to blend the two in a sincere way that actually results in the kind of political change we so desperately need.” Millennials who seek out witchy products may find themselves accidentally supporting businesses that bear no relation real witches. Perhaps the same mechanisms that make the witchcraft/wellness movement so problematic are the same ones that cause millennials to seek out witchcraft in the first place. Miya Tokumitsu elaborates on this dialogic relationship, writing, “Neoliberalism has not only given us crippling anxiety, but also its apparent remedy. It is no coincidence that as we become more nervous, ‘wellness’ and ‘self-care’ have become mainstream industries.” Increased corporatization, rising rates of unemployment and accompanying skyrocketing populations of depressed and suicidal people can leave many of us feeling wracked with anxiety and looking for a holistic approach to our problems. Unfortunately, many of us are looking for solutions we can easily purchase– often from companies who exploit their workers and market to consumers based on harmful rhetoric. In an article for The Baffler, Laurie Penny writes, “The more frightening the economic outlook … the more the public conversation is turning toward individual fulfillment.” The desire for personal enlightenment can come at the expense of more group-focused healing. Penny adds, “[The wellness agenda] prevents us from even considering a broader, more collective reaction to the crises of work, poverty, and injustice.” Rather than consulting real brujas, we look to online marketplaces and mall shops. Rather than learning about the history of witchcraft and its relationship to racism, colonialism, and misogyny, millennials are looking at “witch” culture as an opportunity to experiment with aesthetics and try to improve their own lives. Perhaps there is no magic solution for the malaise so many experience due to depression, isolation, and alienation– but a good start would be community-building, learning one’s history, and acknowledging those that came before us. When we do this, the real magic can begin.